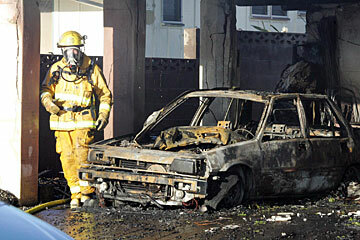 A fireman walked past a gutted car yesterday following a fire in Salt Lake where a couple was critically injured. 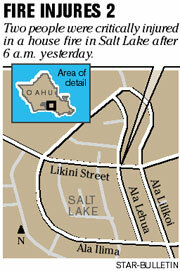 Honolulu firefighters rescued a Salt Lake couple from their burning home early yesterday. The couple, John Takami, 81, and his wife, Nellie, 82, suffered second-degree burns and smoke inhalation and were taken by ambulance to Kaiser Medical Center, where they were listed in critical condition. They were transferred yesterday to Straub Hospital, where they remained in critical condition. The first group of firefighters was dispatched at about 6:12 a.m. and said they could see the fire long before they got to the scene at 984 Ala Lehua St. A second alarm was dispatched a few minutes later. Acting fire Capt. Charles Griep said, "We could see the glow already of the fire" as his crew approached the Salt Lake Shopping Center, which is several blocks away. When firefighters reached the house, they found it fully engulfed in flames. Neighbors told firefighters they believed that there were people trapped inside. "I believe the elderly couple were sleeping in the living room," said neighbor Liz Ferguson. "The girlfriend of one of the nephews lives there, but she went to McDonald's to get coffee and when she came back the house was already on fire," Ferguson said. Griep said firefighters entered the home through a window and found the woman almost immediately, then found her husband a short time later. Both were treated at the scene before being taken to Kaiser. Firefighters found both in the living-room area. Neighbors said that while Nellie could walk on her own, her husband sometimes used a walker or a cane to get around. "Sometimes they have the Handi-Van pick them up. They're a real nice couple but they had trouble moving sometimes," said neighbor Derek Yee. Yee said the flames were so intense they obscured the roof of the house, and the heat generated by the fire melted a plastic tarp covering a truck parked across the street. Honolulu Fire Department spokesman Capt. Emmit Kane said the fire appeared to have started from the carport and then spread into the attic of the main house. "There was a lot of fuel load, stuff in the garage, stuff stacked on the walls, on the dining room table. There was a lot of personal belongings just all over the place," Kane said. Kane confirmed that besides the elderly couple, two of their nephews and one nephew's girlfriend lived at the house on a weekly basis. Neighbors said there was a shanty type of lean-to constructed in the carport where the girlfriend lived. The fire caused an estimated $300,000 in damage. The fire investigator was trying to determine the cause of the fire, fought by as many as 35 firefighters.